Innovation & Tech Today recently spent some time at the Denver Auto Show, and we saw some really cool innovations occurring in the automotive industry. One of the most intriguing cars I saw was the new BMW i3 electric. Full disclosure: I drive a BMW 1984 325e, and have been a fan of “Beemers” since I was in high school. Initially, I had some reservations about the i3 because of how radically different it looks compared to other BMWs. However, the technology in the car is undeniably fascinating so I wanted to learn more about this new direction the company is taking. Thankfully, Matt Rebeck from BMW was kind enough to sit down and tell me a little more about the i3. Innovation & Technology Today : It’s nice to meet you Matt, so what do you do for BMW? Matt Rebeck: I work at Ralph Schomp BMW in Highlands Ranch, Colorado as a BMW Genius. I was the first BMW Genius in Colorado. I&TT: What is a BMW Genius? MR: The Genius program is new to BMW North America in 2013-14 after a big success overseas in 2012-13. The concept is for the Genius to be a pressure-free liaison for customers looking to learn more about the BMW brand and our lineup. I work with new customers as well as post-sale customers needing guidance on the technology, refresher courses, or something as simple as pairing a client’s new smartphone. In short, a tech savvy individual assisting our clientele in getting the full use out of their vehicle. I&TT: Could you give us a little background about the i3, how it was developed, as well as some of the specifications? I&TT: What makes the i3 different than some of the other electric and hybrid cars on the road? MR: The i3 is the first EV built from the battery up, whereas other EVs have placed a battery and electric motor into an already existing standard vehicle platform. LifeDrive architecture was used is designing the i3. It is comprised of 2 modules or “shells”. The “life” shell is constructed of Carbon Fiber Reinforced Plastic, while the “drive” shell is made of aluminum and houses the battery and wheel assembly. Weighing in at a timid 2,700 pounds including the battery. On the interior of the car, a sustainable green approach was taken. Recycled plastic bottles are used to create the wool fabric for the seats. We use Olive leaf dyed leather instead of traditional leather, which is ultimately better for the environment. A sustainable fiber called Kenaf was used for different panels on the doors and dash. Environmental considerations were also taken in the overall production of the vehicle, not just the zero emission aspect. Both production plants used to build the i3 use 100% and 80% renewable power sources. From cradle to grave, the car creates 50% less of a carbon footprint than a standard vehicle, on top of being emission free. I&TT: Why was carbon fiber used in the car? MR: C.F.R.P. was used to save weight for both performance and to extend the range of the electric motor. Carbon fiber is lighter and stronger than steel, so it was an easy choice. I&TT: It seems that the reviews online are almost universally positive about how the car drives, especially compared to some other electrics, how was BMW able to achieve this? MR: BMW stayed true to their 50/50 weight ratio promise. 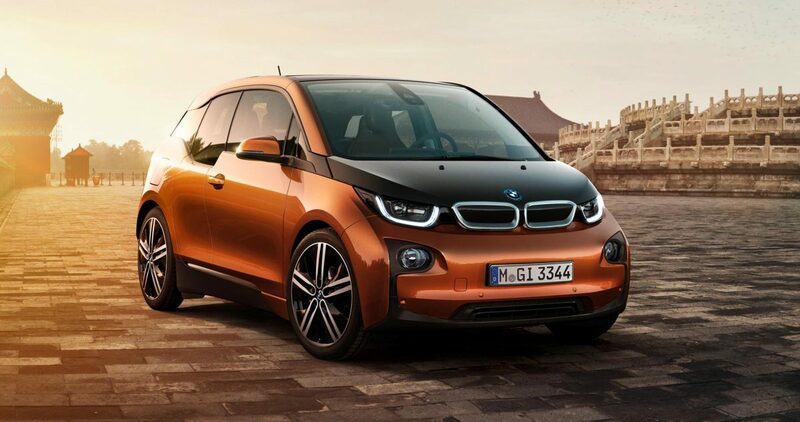 The i3 has 50% of its weight over the front wheels and 50% over the rear, like all BMWs produced. That balance helps with oversteer and understeer in reference to handling. BMW achieved this by placing the battery underneath the floorboard between the wheels and under the passenger, evenly distributing the weight throughout the car. This also keeps a low center of gravity and places it in a better position in the unlikely event of a crash. I&TT: I think it’s fair to say there has been some controversy about the look of the car, do you think the i3 has been able to balance the aesthetic and performance heritage of BMW, while trying to be innovative and looking towards the future? MR: I do. On the performance side, with an electric motor, you get 100% of the torque with 0 RPMs, so the i3’s 0-60 is a surprising 7.1 seconds. With aesthetics in mind, BMW is really trying to set the ‘i’ branding apart with the i3 and it’s older brother, the i8. It has electric blue accents, as well as a black hood, trunk, and roof. The use of “U” shaped LED headlamps differs from BMWs normal use of “halo ring” headlights. The “U” shaped brake lights appear as if they are floating. The i3 holds true to the luxury side of the BMW brand. With sustainability in mind, the i3 is “luxury with a conscience”, all the while having that “no compromise” attitude towards performance. I&TT: Could you tell us about some of the technology in the car? MR: Of course. With the i3 being a fully electric ready-for-the-city vehicle, we didn’t hold out on the technology side of the car. BMW’s infotainment system, iDrive 4.0.2, is in use allowing Bluetooth audio, Bluetooth telephone streaming, a 20GB hard drive, & USB iPod interface. The navigation is equipped with a dynamic range map. This calculates the range of the vehicle, and displays it on the map. It takes into consideration speed and topography with a normal driving style. The nav also has the ability to search for charging stations. Also, BMW apps/BMW Connected is included within the system allowing for full smartphone integration for Pandora, Facebook, Audible, Twitter, and Aupeo. There will be 2 digital displays; one for iDrive, that will appear to float above the dash, and one directly in front of the driver, in place of a traditional gauge cluster. There you will find speed, battery life, range, and other indicators. Another exciting option is Active Cruise Control (ACC). ACC allows the driver to set the cruise control and the system will automatically adjust your cruise control speed setting to match the vehicle in front of you and keep you paced behind them, handling everything in the car but steering. In addition there will be an iRemote smartphone app available for the i3. This will allow you to see battery charge level, range, remaining charge time, and also pre-condition the vehicle, all directly on your smartphone. I&TT: Thank-you Matt, how can our readers find out more about the car?